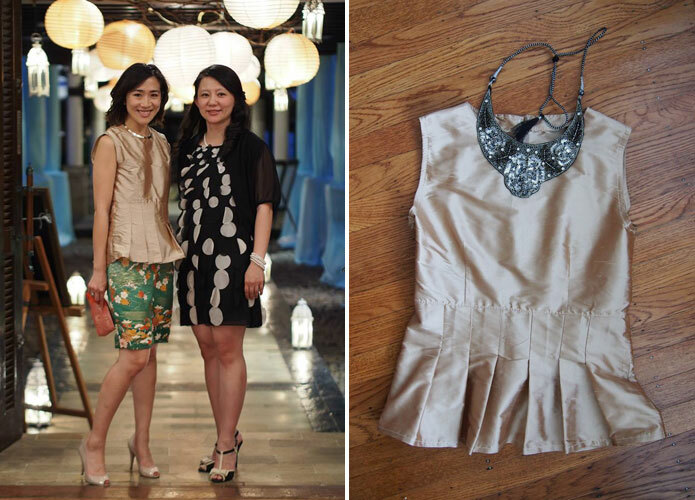 I searched everywhere for a gold peplum top to wear to my cousin’s wedding in Indonesia. 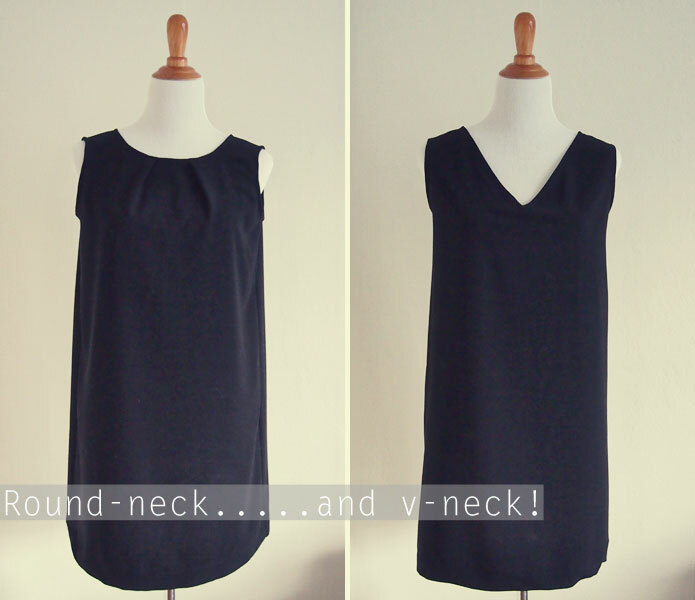 In the end, I realised I could make a nice, silk version myself using a sewing pattern I already owned. 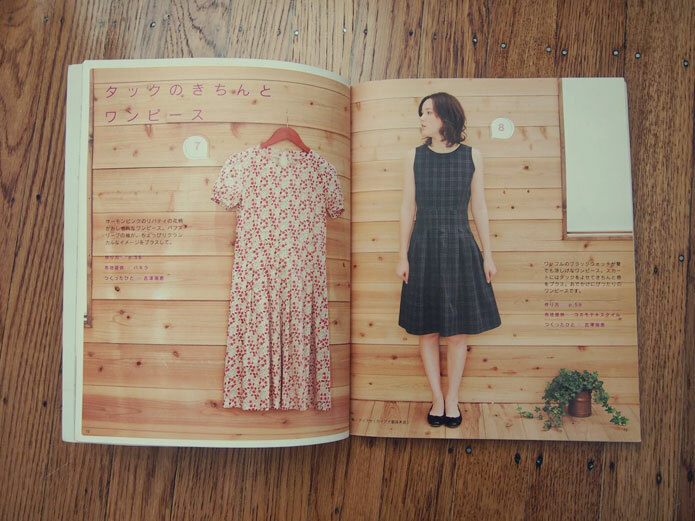 No, I didn’t have a peplum top sewing pattern, but I used instead, a dress with a pleated skirt! 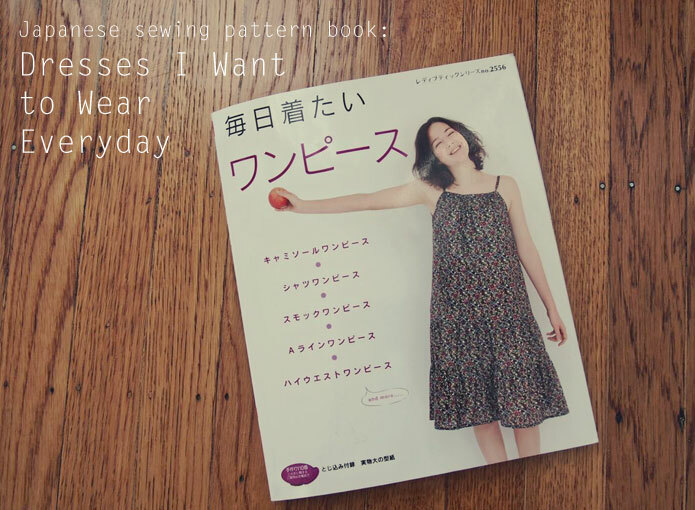 I used the sewing pattern from the Japanese book, Dresses I want to make everyday (I reviewed this book in a previous post). 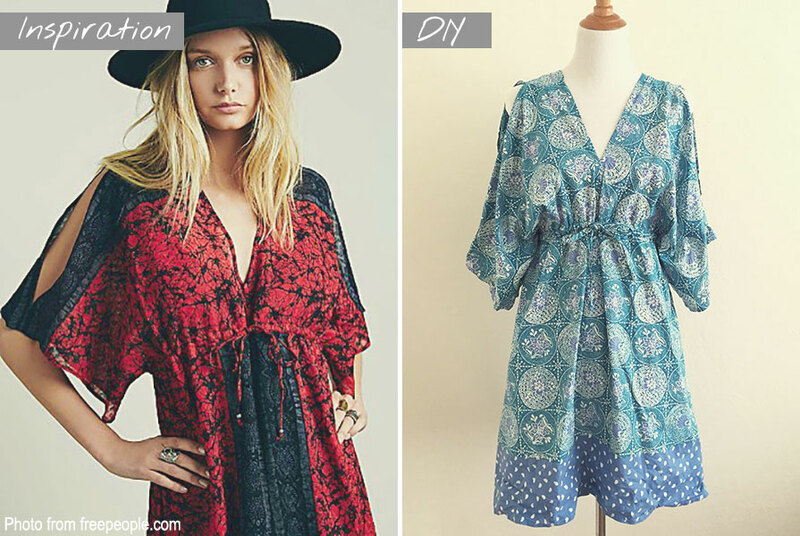 Find a fit and flare dress with a skirt that starts to flare immediately below the waistline. 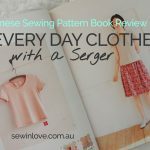 The waistband of this dress is cut quite high, so I only needed to shorten the skirt to create the “peplum” part of the top. Looking at pictures of peplum tops online, I decided I wanted the peplum to sit at my hips. All I had to do was shorten the skirt to 9 inches (22.86cm). I purchased the gold 100% silk taffeta on eBay for $30. It matched the green kimono fabric skirt my grandmother made for me perfectly (below is me at the wedding with my cousin from Sydney). The gold is very festive, so I’ve been wearing the top to holiday parties as well. A similar silk top would cost a lot more than just $30, so I’m pretty chuffed with the result. 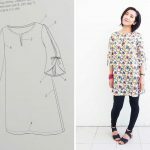 Do you have any dress sewing patterns on hand that could become peplum tops? What a clever idea! 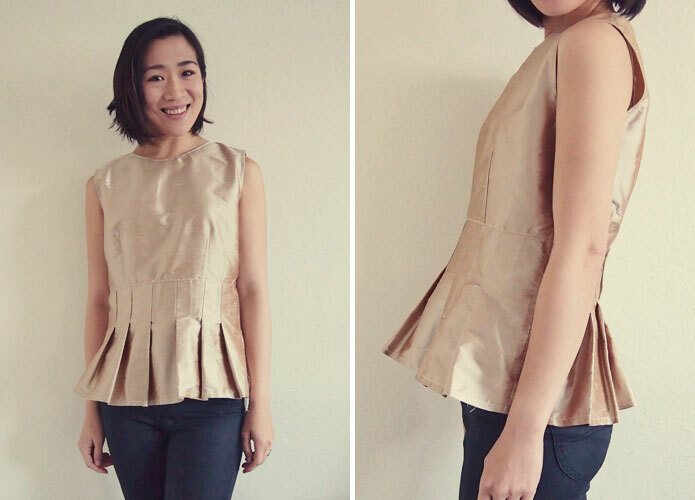 I love how the pleats add a different detail to what you usually see on peplum tops. You look gorgeous! Thanks Em 🙂 The pleats certainly makes this top unique! what a fantastic idea. I generally dont like peplum tops but i LOVE yours!! I’m going to have to save this idea for later! 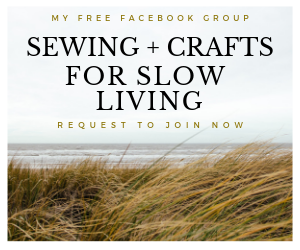 Too much sewing, not enough time! Its a shame we have to sleep! Me too, I found many peplum tops to be OTT, with the peplum looking more like a tutu. 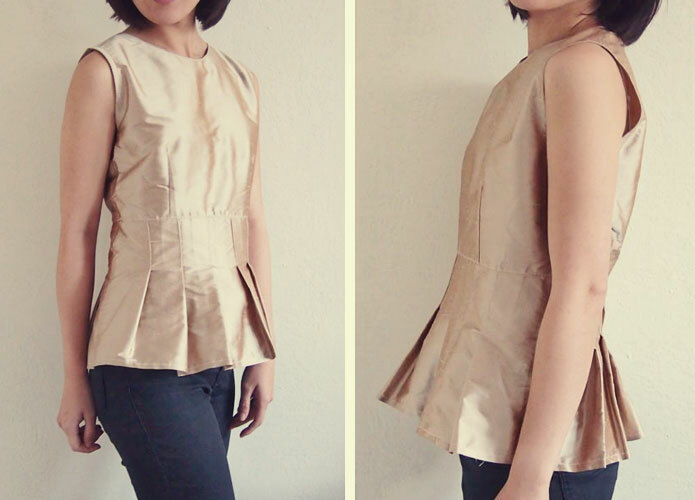 Glad you like this one with a more subdued peplum. You look fantastic! The top is beautiful, the colour and everything and it hangs very nice on your body, much better than the peplum tops I saw before. I am a fan of Japan. Thx for sharing. Thanks Claudia. It’s one of my fave tops ever!